Findings from the archaeological excavations, works of art and tools ranging from the prehistoric times up to early Byzantine times (4th century BC to 6th century AD) are on display in the archaeological Museum of Naxos. 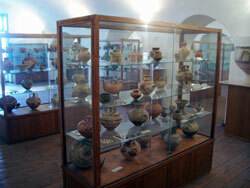 The exhibits come from Naxos and the small surrounding islands of Keros, Donousa and Koufonisia. Most of these artifacts have been discovered in tombs and are made of gold, silver and bronze, clay and marble: pottery, tools and bronze weapons. The museum has a large collection of Cycladic idols. The later Mycenaean period (1400 BC - 1100 BC) is represented by rare specimens of pottery, objects made from ivory and gold, beads from semi-precious stones and rings etc. From the Geometric period there are large pitchers and other pots on display, and from the Roman period, wonderful glass objects. There is also a collection of statues and tomb columns.